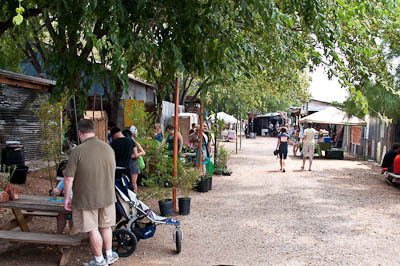 Finally made it out to the HOPE Farmers Market on Sunday to cash in my Max Parfait LunchDeal coupon. 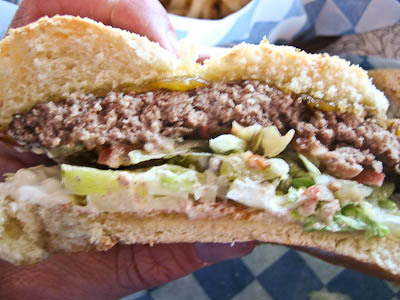 Overall, tasty burger, cooked well (still pink–see pix below) and good fries. 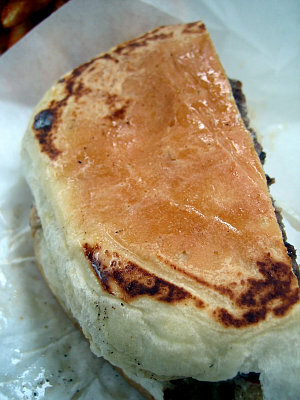 The bun is homemade and is nicely toasted on the grill (exterior bun grill marks is a major plus). 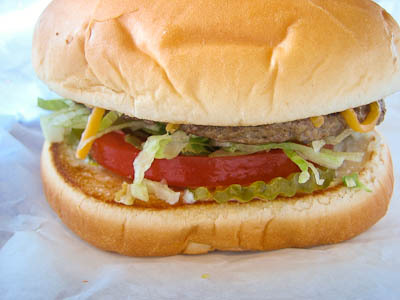 The burger patty is thick but not huge–I found the burger size to be just right–and is laced with some herbs, as you can see in the cross section picture below. Had a good flavor. I’m generally not a fan of mixing stuff into the meat before cooking, but this worked well. Nothing overpowering in the spices. The beef is cooked over pecan wood, which is a plus. I got the cheeseburger (with cheddar, of course), which I recommend, but was a bit taken aback by the $1 surcharge for cheese (seems a tad steep, but I imagine it’s quality cheese). 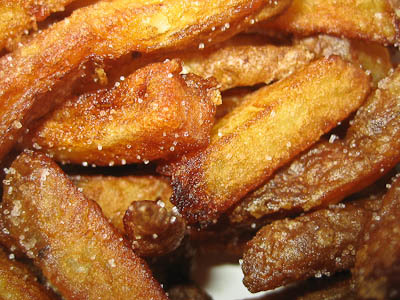 Fries are called “Belgian Fries”. 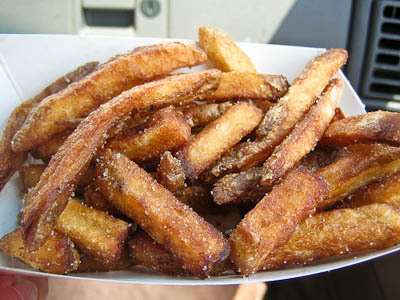 Not clear on what makes a fry Belgian (I did find some info at belgianfries.com, of all places, but no way to know if this is authoritative), but these were delicious, had a slightly sweet taste to me, and were seasoned with just the right amount of salt. They fry them in olive oil. On the downside, it took a long time to get our food, but it’s a small trailer and of course everything is made to order, so it takes a while. And the HOPE Farmers Market was not the most inviting environment on a hot August day. Dusty hot surroundings. Unkempt Austin Hippies wandering about, Yoga occurring inside one of the unconditioned spaces, incense wafting from another, etc. 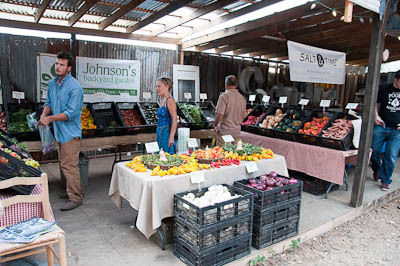 There was a pleasant band playing there, which was a plus, but I found the farmers market very run down feeling, and hot, and dusty, and…hot. Maybe it’s more pleasant during the spring at the height of the produce season. 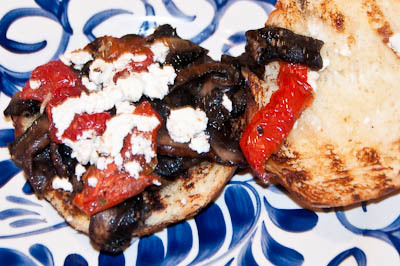 Oh yeah, also sampled the portabella sandwich, was good. 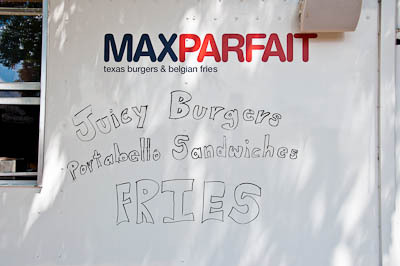 So, would definitely eat at Max Parfait again. Would love to see them land in a Brick and Mortar location with some air conditioning! 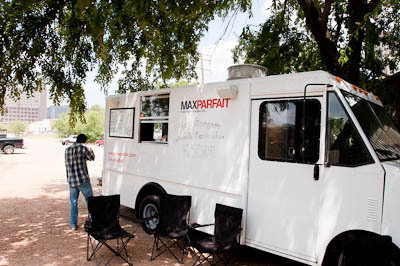 Currently, you can find the Max Parfait trailer at the Barton Creek Farmers Market on Saturdays, and the HOPE Farmers Market on Sundays. Check their website for the latest details or follow them on twitter. Hopefully they can aim that trailer up north during the weekdays. Hey Chris…thanks for making down to see us. It sounds like we didn’t bring our “A” game for you. I’m really sorry about that. We’re still working out some kinks, and hopefully your next visit can be a big improvement. Regarding the cheese, yes, it is a premium aged cheddar…a little pricier, but I think it’s well worth it for the flavor it gives the burger. We’ll keep our eyes open for potential locations up north…please say hello next time you stop by! Would you have any idea on how to get a hold of the old 2Js special sauce? Just learned of yet another trailer that sounds like it has the makings of a great burger and fries. 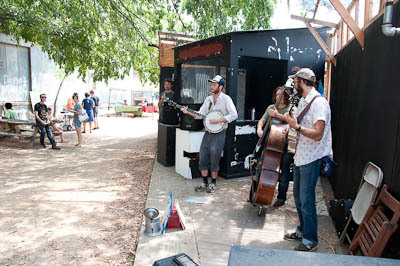 I have yet to experience any trailer grub because I am just never in South Austin, where most of this trailer explosion seems to be occurring. Max Parfait may entice me to head south. 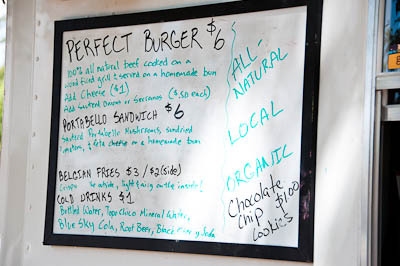 Full details at their site, but the quick summary: wood-fired grill (this is one key to taking a burger from good to great), all-natural beef, homemade bun, fresh hand-cut “belgian” fries cooked in olive oil (a la Elevation), cane sugar sodas. Sounds like a winning combination to me (no mention of cheddar though). Fantastic! Looking forward to giving it a try. In the meantime: I wish someone would make a real grilled chicken sandwich in town that wasn’t either… 1) a pre-frozen big chunk (sorry Top Notch) or… 2) ground like beef, which just doesn’t work for a primo chickenburger (sorry P. Terry’s). Something thin, pounded out a bit like a really good CFS should be, but grilled to perfection, weight-wise on the lighter side, just a bit of protein… chickenburger folks don’t need some big slab o’ meat… they are not big eaters, they need to save some space for the fries…. Okay Burger Nation, I know this may not be the right arena to put this out there, but I don’t know of a Chicken Burger News blog….! Heh heh, good luck, hermano. Surely there will be a grilled chicken trailer somewhere soon. In the meantime, you might consider jumping back to the red-meat side…you never know. BNG’s Bro- great news! We’re going to have a pulled chicken bbq sandwich in a couple of weeks to round out our menu…fire grilled chicken & homemade bbq sauce on a homemade bun…it’s fantastic. We’ll let you know when it’s ready to be fired up! Made it out to one of my favorite burger places for the first time in a long time, Top Notch on Burnet Road. It’s a rare original in Austin, going on 40+ years now. There’s a very family friendly feel to it with the mother-daugther combo usually running “the front of the house” (I learned that phrase on Top Chef). 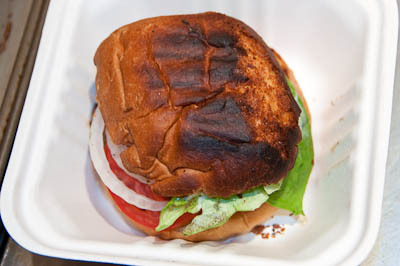 The burger is flame-kissed over charcoal briquettes, thin patty. Fries are frozen. 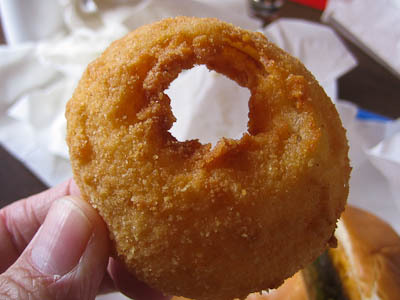 Onion rings are made in-house and are tasty. The fried chicken is good. 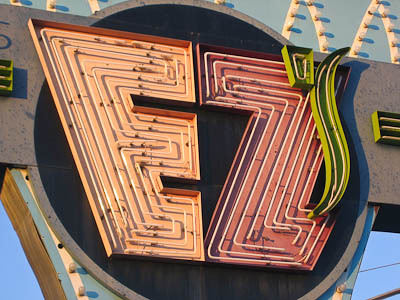 The classic signage is great. 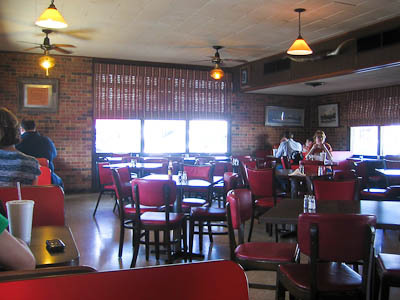 They offer curbside service in addition to a dining room. 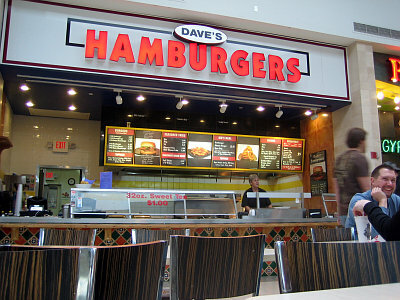 They bus your tables for you (you pick up your food at the counter). Coke, not Pepsi. There is nothing not to like about Top Notch. One thing that resonates with me about Top Notch is the configuration of the #2 with cheddar. 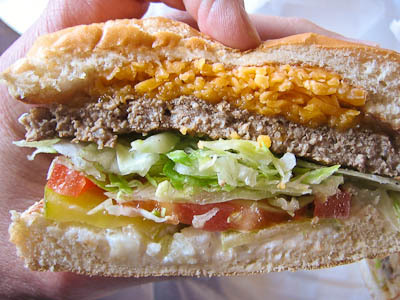 It’s the burger I always order, and it’s so perfectly conceived that I don’t have to alter anything about it–comes with grated cheddar, mayo, lettuce, tomato, pickle and diced onion on a toasted bun. That’s the perfect cheeseburger setup in my book. 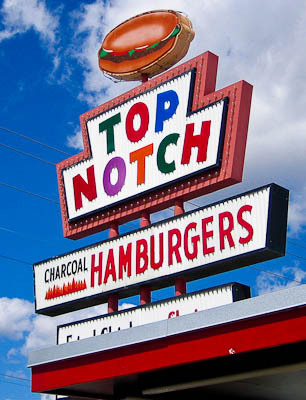 The fact that Top Notch has this precise burger configuration as a standard menu item indicates a harmonious concordance between my burger psyche and Top Notch that’s hard to deny. The beef at Top Notch cannot boast a hormone-free grass-fed antibiotic-free etc. provenance, like so many of the new burger spots, and the fries are not fresh cut…but it has something special about it that more than compensates for any of those shortcomings. 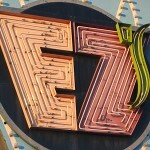 EZ’s is almost a local chain. Based out of San Antonio with only one Austin location and five in San Antonio. 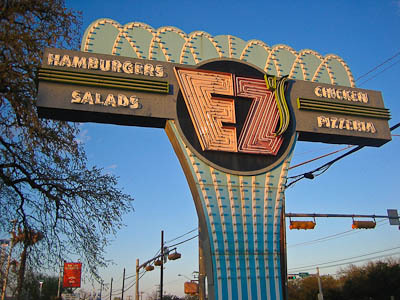 Their Austin location is in the former 2J’s Hamburgers spot on North Lamar, across the street from Central Market. They sport a wood fired brick oven for pizza and flame-kissed burgers, along with chicken and salads and other options (full menu pdf). My experience has been very hit or miss here. 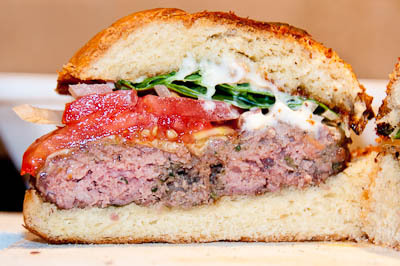 Sometimes the burger is outstanding–juicy and full of grill flavor. Other times it’s dry and overcooked. 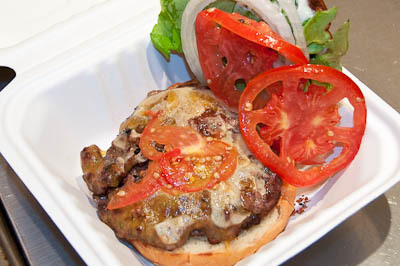 They do offer cheddar and a few specialized burger options, like a poblano burger and a “bean burger” with fritos and refried beans. 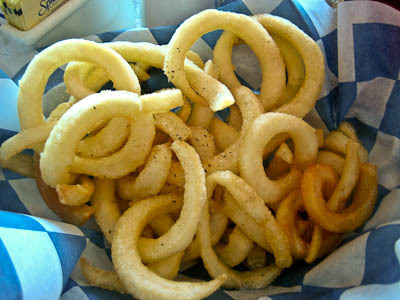 Fries are unremarkable curly frozen fries. 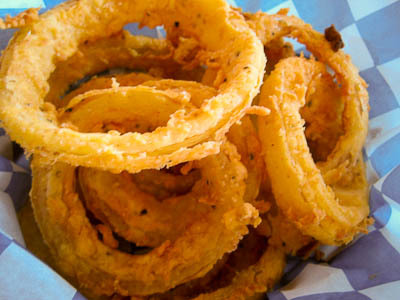 Onion rings are tasty and appear to be made fresh in house. 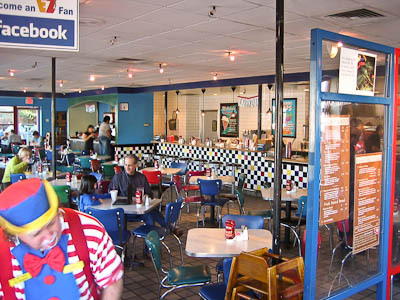 Kids eat free on Wednesday nights–beware the clown. 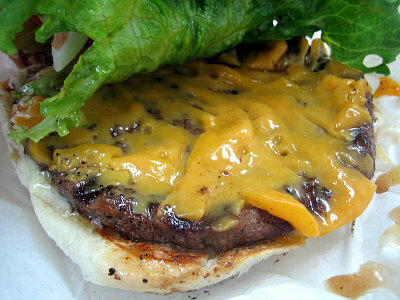 I think I will request a specific doneness next time and see if that results in a more consistently juicy burger. This post finds me inside a mall eating at a food court. That’s how sad the burger scene is here in North Austin. Learned of this place just the other day so decided to give it a try. 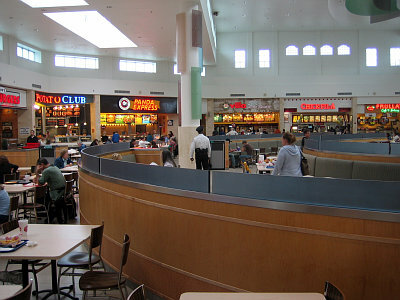 It’s a local mom-n-pop joint in an unlikely spot–the food court at Lakeline Mall, next to the Chick-Fil-A and the Subway and the other generic food court eateries. My low expectations (given the locale) were exceeded by the friendly staff (defninte mom-n-pop feel to it) and the good enough burger. I got the 1/4 lb. combo. They use fresh beef and cook it on a grill, so there was some flame-kissed flavor. Cheddar cheese is available, which is a plus. 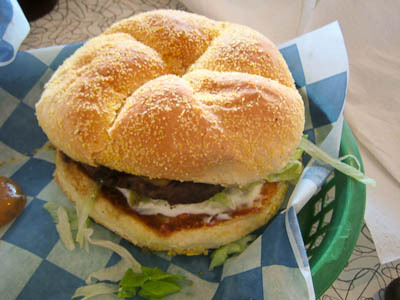 The bun reminded me of Moonie’s–a tad sweet tasting. Top and bottom bun toasting in evidence. 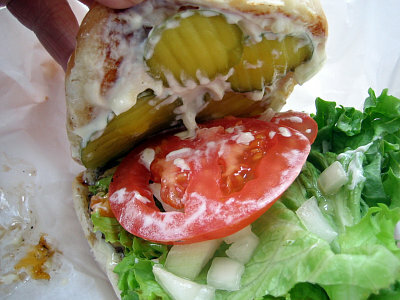 Both buns were slathered with ample mayo–no DBS (dry bun syndrome) here. Fries were ho-hum frozen seasoned fries. So not bad for a food court. Friendly mom-n-pop spot. Conveniently located across from Frederick’s of Hollywood. Certainly not a great burger, and I wouldn’t make a special trip to the mall just to eat there, but it’s worth a stop if you need a break between Dillards and Spencer’s. No Dry Bun Syndrome here! Had lunch at NXNW today. 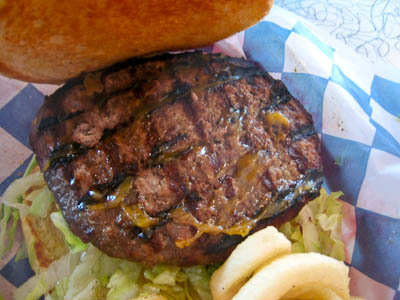 Fairly pricey burger was just ok. 1/2 lb, grilled, but not much grilled flavor. Burger was suspiciously perfectly circular and uniform in thickness. 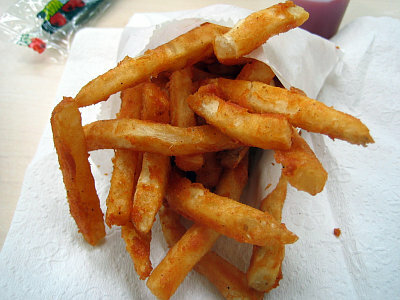 Fries appeared to be standard-issue frozen and then doused with garlic bits. Did not think the addition of garlic was a great idea. I like garlic, but would rather eat good fries au naturel. So, burger was just OK. Not up to the level of say a Houston’s burger, which is similar in size but far surpasses my North by Northwest burger in taste. I swear the last time I went to Kerbey Lane (not often), I had no choice but to suffer through their miserable “home fries” with my burger (said home fries are also bad with their breakfasts). This time I noticed “fresh cut French Fries” as a side option on the menu. 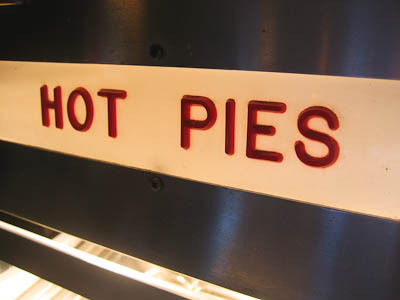 Asked the waitress if they have always had them, and she said they were just added to the menu 4-5 months ago, but they’ve always been available as a kind of “secret menu item”. News to me. So, had a Kerbey Lane burger today. 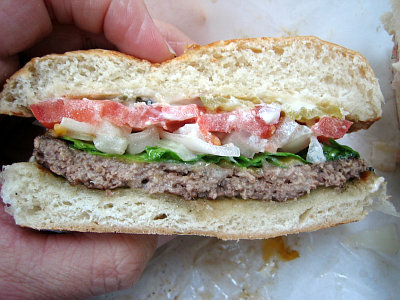 It’s 1/3 lb, so not thin patty and not overwhelmingly grande. 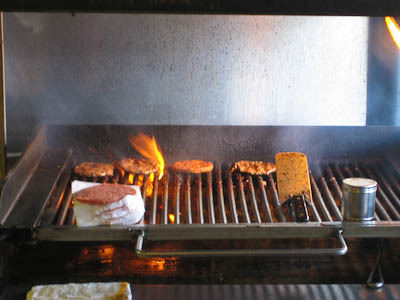 Grilled (evidence of grill marks on patty). Cheddar available. 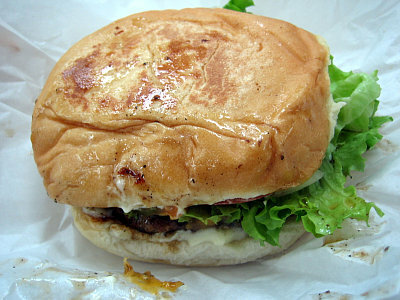 Flavor of the burger was pretty good, with a definite grilled/charred taste (which I like). 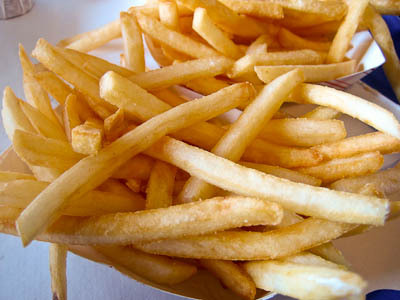 Fries were good–not greasy, and plentiful. 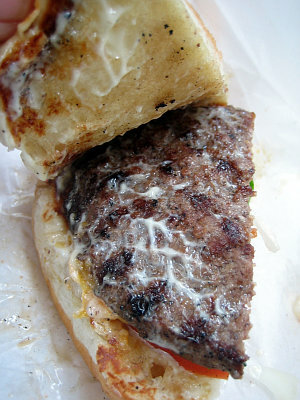 Only downside to the burger is that it was quite dry. I believe the menu indicated they use “lean beef”, so there’s an issue right there. 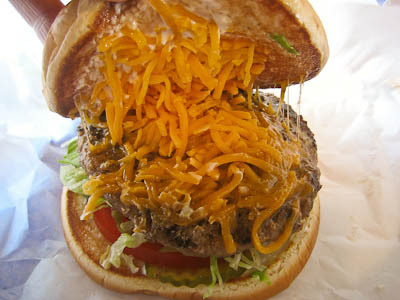 As we know, chuck makes the best burger, at 20% fat content. Lean = dry. Upshot: decent burger and fries, but burger too dry to lure me back.